DFX Pro Staffer, Paul Basagoitia of Minden, Nevada, has been a fixture in the mountain biking competition circuit since 2004, when he burst onto the scene by winning the slopestyle event at Kokanee Crankworx in Whistler, British Columbia, a title he successfully defended the following year. 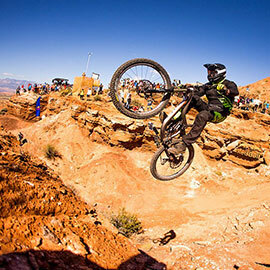 He took home the top spot in the Teva Mountain Games slopestyle competition in 2009 and 2010. And never were those skills more apparent than when he went out into the Utah desert and landed the first double backflip on natural terrain in history. And he did it with a minor concussion that he got on an earlier crash. I have been riding since I was 8 years old. Basagoitia credits the movie ‘Rad’ for getting him into mountain biking saying; “I wanted to be just like Cru Jones.” Basagoitia also raced BMX for 6 years and loves wakeboarding and riding 50’s.